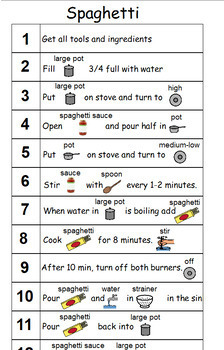 A visual recipe including the tools and ingredients needed for making spaghetti with sauce. The knobs for turning stove to medium-low and off are left blank so that you can draw in to match your stove! The recipe makes a serving for 2 people. It could be adjusted for one person by decreasing amount of sauce. There is also a version included without visual supports for more advanced learners.